As many of you know, my husband and I used to live in Dallas before moving to Washington to take over winery operations. Shortly after getting married we flew to Seattle to meet his family! One afternoon Ralph announced that he was going to take me sightseeing in downtown Seattle. We were in the car looking at a map when his sister, Jan, came running towards the car with a large black garbage bag. She handed it to Ralph who put it in the back seat mumbling that he needed to drop it off at bla-bla-bla… I didn’t really listen and didn’t ask questions. I was busy looking through Seattle magazine picking out a restaurant for dinner. Our first stop was supposed to be the Space Needle but as we turned a corner, Ralph pointed out the rounded towers of the Westin Hotel. He had mentioned long ago that he always wanted to stay at that hotel some day and see the view of the city by night but that wasn’t even registering in my mind. I watch Ralph’s face turn a bright shade of red, and he stuttered with a reply about a surprise and handed the bellman The Black Plastic Garbage Bag! Well, maybe I did feel a little embarrassed checking in like a Bag Lady, but I got over that really fast. Just think about the movie “Sleepless in Seattle”… I know it’s a chick flick, but I get the same warm and fuzzy feelings watching that movie as I do thinking about my “Romantic Get-Away in a Bag”. So by all means… plan your get-away soon and maybe pack a suitcase first ‘cause clothes get sort of wrinkled stuffed in a bag. Last piece of advice… if it’s a special “decade” type birthday celebration, don’t give your sweetie a set of knives… even though we still use them to this day. Red Wine, Chocolate and “Your Heart” are all we need. Kathy Charlton worked for the high-tech giant, Texas Instruments, for 25 years. A born entrepreneur, she earned a reputation as a highly effective manager by “making things happen”. Recognized early on for her abilities to get to the bottom of a problem, analyze it and come up with a workable solution, Fast. It wasn’t long before her assignments moved outside her comfort zone of finance into the business sectors. Then in 1999, life threw Charlton a winery! She and her husband purchased Olympic Cellars, a bankrupt boutique winery in Port Angeles, Washington. 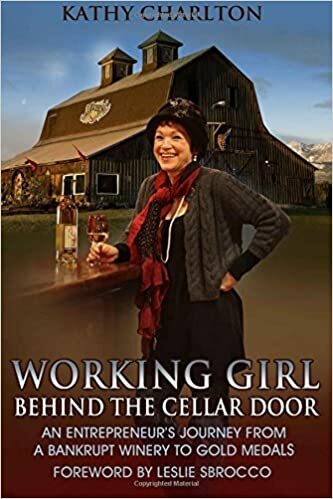 Bucking tradition Charlton rolled-up her sleeves and began to rebuild her winery. Driven by a personal motto of “out of sight, out of mind, out of business,” marketing became her middle name sparking a new passion for “off-the-wall” marketing. Women and wine became the platform to reinvent the winery through creative labeling, philanthropic initiatives in support of women, and a series of ongoing unique winery events that piqued the interest of consumers, industry players and the media.